Thrashing jazz drums accompany two of the best films released this year. Both efforts are about artists who are more than willing to torment themselves in order to prove worthy of their demanding crafts. In Damien Chazelle’s Whiplash, young Andrew Neyman, played by Miles Teller, goes to extremes to realize his dream of becoming one of the world’s great drummers. 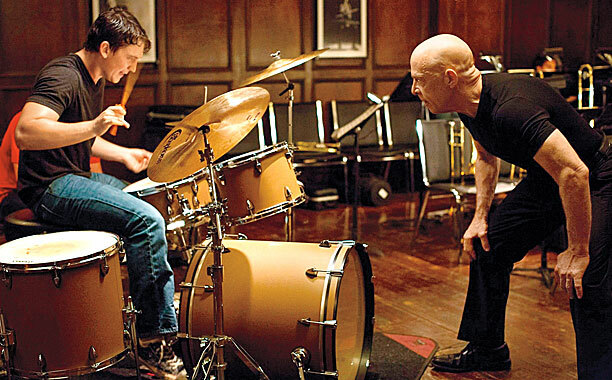 Whiplash, directed by Harvard graduate Damien Chazelle, is based on an 18-minute version of an earlier film with the same title. His charming first feature, Guy And Madeline On A Park Bench, was shot in black & white entirely around Boston, and is filled with as much tap dancing and singing as you would find in a low budget 1930′s musical. It is a delightful short film about music and the travails of young love. Justin Hurwitz, who wrote the music for Guy And Madeline … also wrote much of the score for Whiplash, in which the earlier charm and hoofing gives way to blood, sweat, and tears. Chazelle understands the physicality of playing an instrument. He moves his camera in on faces, lips, hands, and horns and jolts the music along with rhythmic cuts. Whiplash‘s plot focuses on Andrew Neyman, a drummer who practices with determination to be the best, but that just isn’t enough to please his abusive bandmaster, Terrence Fletcher (J.K. Simmons in pitbull mode), who runs a big band of young hopefuls like R. Lee Ermey with a baton. (Ermey famously played Gunnery Sergeant Hartman in Full Metal Jacket.) Simmons sheds every remnant of his earnest and befuddled dad persona (Juno, Men, Women & Children, etc) and dives into this part with the relish that comes from total conviction. Fletcher’s method for fostering resilient and disciplined musicians is to hurl a colorful assortment of derogatory and homophobic insults at them. He believes tough love makes outstanding players, repeatedly citing how Joe Jones once threw a cymbal at the head of young Charlie Parker for lazy playing. (This anecdote is exaggerated). Simmons takes particular delight in demeaning those in the drum chair, and young Andrew rises to the bait. He practices until his fingers are bloody and attacks the skins as if his life depends on it. I have been a professional drummer for well over forty years and I never experienced anything quite as insane or unlikely as what this ambitious youngster does. But without raising the stakes a film can’t show the drive nor make tangible the long hours of effort that a musician puts into mastering his instrument. Here the stress level generated by Andrew’s dreams hovers somewhere between utter hell and a nail-biting sports movie. As in Chazelle’s last film, Whiplash is more myth than reality. The story builds tension through exaggeration, but the director is a drummer himself, and understands well that the physical nature of the instrument is a great vehicle for envisioning the agony and hours of frustrating defeat spent in pursuit of artistic success. If the character were a bass player they might focus on a girlfriend problem, or a horn player could have a drug issue. But the drummer? He beats on his instrument and on himself. To the credit of Chazelle and actor Miles Teller, the drumming in the film is convincing, a credible dramatization of the experience of playing the instrument. This is not Sal Mineo in The Gene Krupa Story. The camera moves into and dwells on the playing. Chazelle understands how important it is that a drummer needs to sit back on the right tempo (which becomes a major source of offense for Fletcher). The director also knows the drums are difficult, hard on the body, and are the foundation of a jazz (and rock) ensemble – thank you very much. While Teller isn’t pulling off the major musical performances in the movie, I am heartened to report that he really does play; Teller looks authentic when he sits at the drums. There’s a ‘secret’ audiotape that has made the rounds for years among musicians. On it, Buddy Rich endlessly abuses his own young band. The master’s unrelenting derision of his musicians was intense, though only half as colorful as the abuse hurled by J.K. Simmons. In his defense, Rich was perhaps the finest drummer of all time, and may have had his own career frustrations. That recording comes close to evoking the haranguing horrors of Whiplash. I’d bet that Chazelle has heard it. It is ironic that Andrew Neyman’s goal is to play like Buddy. It ain’t going to happen. But he’s going give it his all and that’s all we can ask for.